Vancouver Canucks coach Alain Vigneault confirmed Monday that injured winger Daniel Sedin has a concussion. But the NHL club continued to stay mum on the left winger's condition, or possible return before the playoffs. Vancouver Canucks coach Alain Vigneault confirmed Monday that injured winger Daniel Sedin has a concussion. But the NHL club continued to stay mum on the left winger's condition, or possible return before the playoffs. "He's got a concussion, and when we have something more to say, we'll say it," said Vigneault ahead of Vancouver's game against the Los Angeles Kings. "We're just going to follow the [concussion] protocol, and when we have more, we'll share it with you." Sedin was sidelined last Wednesday by an elbow to the head from Chicago Blackhawks defenceman Duncan Keith that resulted in a five-game suspension. The Canuck's condition has been a hot topic of discussion since he was hurt, but Vigneault's comments marked the team's first public confirmation of his injury. Henrik Sedin says the league should change its rules to allow for the assessment of tougher in-game punishment against an offender's team. "On the ice, the referees should have an easier time giving out a few more minutes for the dangerous hits, I think — elbows, boarding, charging and that kind of stuff," said Henrik Sedin. "They're going to injure players. Players are going to respect that more, maybe, than a one or two-game suspension, because if you hurt your team in a game and you lose because of a stupid play, that's going to hurt more in front of your teammates than, maybe, a one or two-game suspension." Keith's lack of previous suspensions influenced the length of the suspension handed down by league chief disciplinarian Brendan Shanahan. Henrik Sedin said the length of the suspension does not matter. "It's about respecting other players, and I hope [Keith] learns something from it — and it doesn't happen again," said Henrik Sedin. The struggling Canucks have shown more spark since Daniel was hurt. But Vigneault said the injury has not served as more inspiration for his players. "That was a very unfortunate incident, a real cheap shot in the game, and losing our top player is not something that we need to come together as a group," said Vigneault. "But it did happen, we have to deal with it, and that's what we're trying to do." Keith elbowed Daniel Sedin after he had shouldered his head into the boards earlier in the game. If a referee felt Daniel had done something wrong, then he should be punished, said his brother. However, Vigneault dismissed the severity of Daniel Sedin's hit on Keith. "The only surprise there was that Danny hit someone," said Vigneault with a slight chuckle. "I'm not sure exactly what happened on that, because Danny and Hank aren't the guys that are the most physical across the league. They'll throw the odd hit in there, but usually it's not a bone-crushing hit." This marks the second time that the twins have been separated for a potentially long period on the ice. 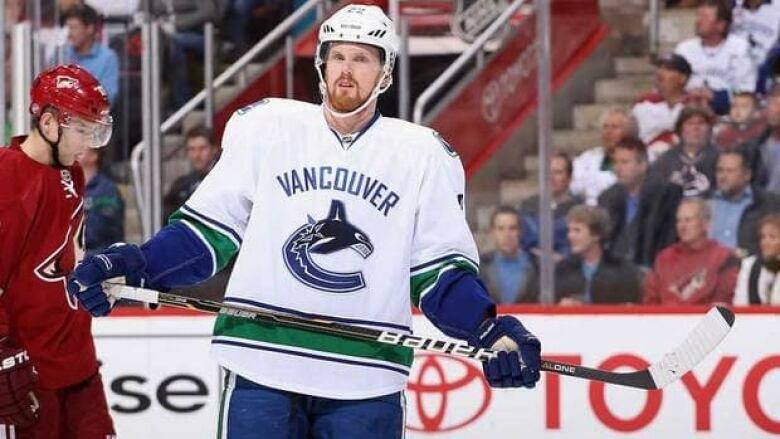 In 2009-10, Daniel Sedin missed 18 consecutive games with a fractured foot suffered while blocking a shot. He also sat out a game later that season. But Henrik still managed to produce points in his absence and went on to win the league scoring title, before his brother surpassed him for the honours last season. Henrik said the adjustment to Daniel's absence is less of an ordeal this time. "I don't think it's easier," said Henrik. "He's one of the best players in the league, but it's less pressure, maybe, right now — because last time around, I had to prove to everyone that we were able to play without each other. Obviously, we're better together, but it's not like I'm getting a big drop-off when he's not there, so that makes it easier." Meanwhile, Vancouver defenceman Keith Ballard, out since early February with a concussion and neck injury, took part in the morning skate. Ballard, who was placed on long-term injured reserve and does not count against the salary cap while he is out, does not have a set return date.